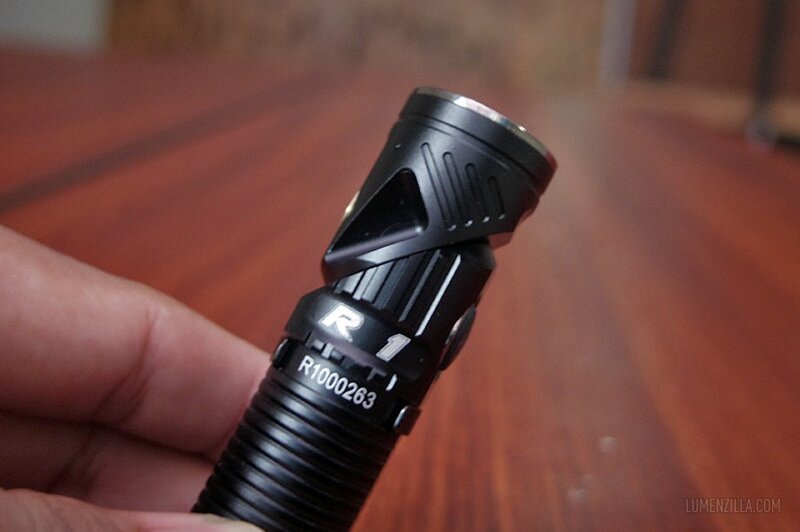 Rofis R1 is a unique adjustable-angle flashlight that utilizes CREE XM-L2 U2 LED with maximum output 900 lumens and maximum runtime 20 days using the lowest brightness mode. 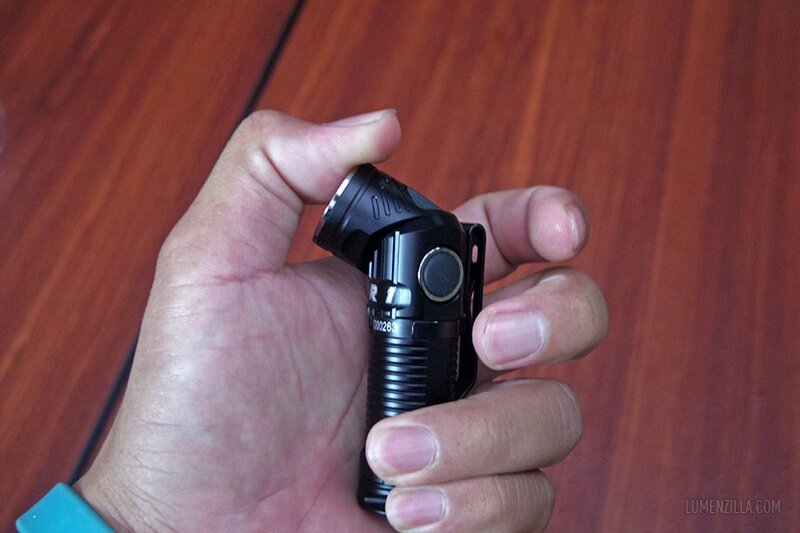 This adjustable-angle flashlight arrived in a good packaging with appealing visuals printed on the packaging. As far as I know, I think it’s the best flashlight packaging (in visual way) I’ve ever seen. Other than the flashlight itself, the package also contains USB magnetic charging, lanyard, spare o ring, head band, manual book, and warranty card. 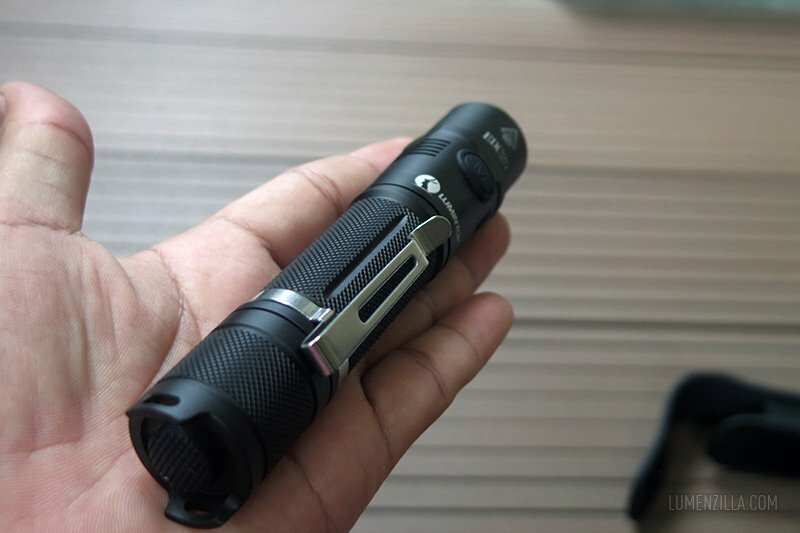 It also came with a rechargeable 700 mAh 16340 lithium ion battery inside the flashlight. 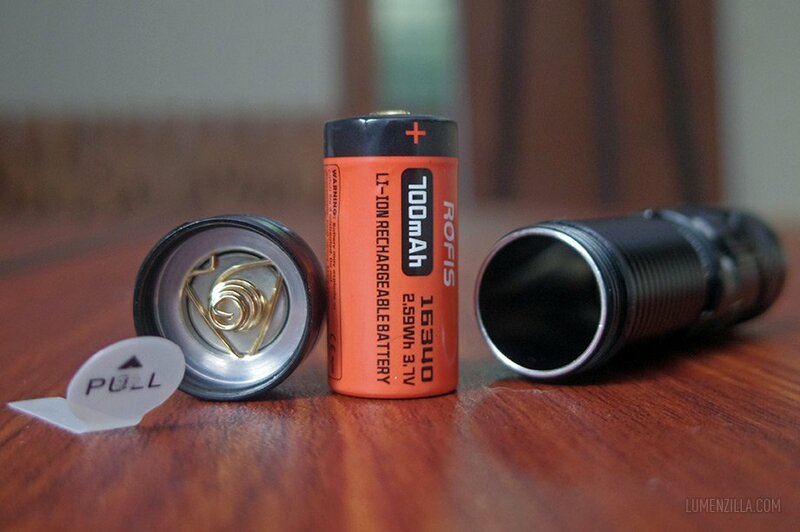 A plastic sheet was inserted between the battery polarity and the springs on tailcap to avoid accidental activation. 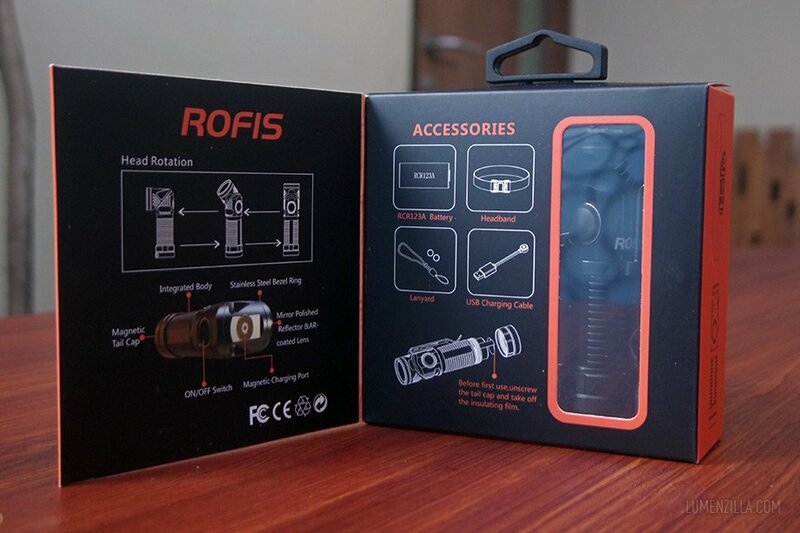 Body of Rofis R1 is built from aluminum with anti-scratch type III hard anodized finish. 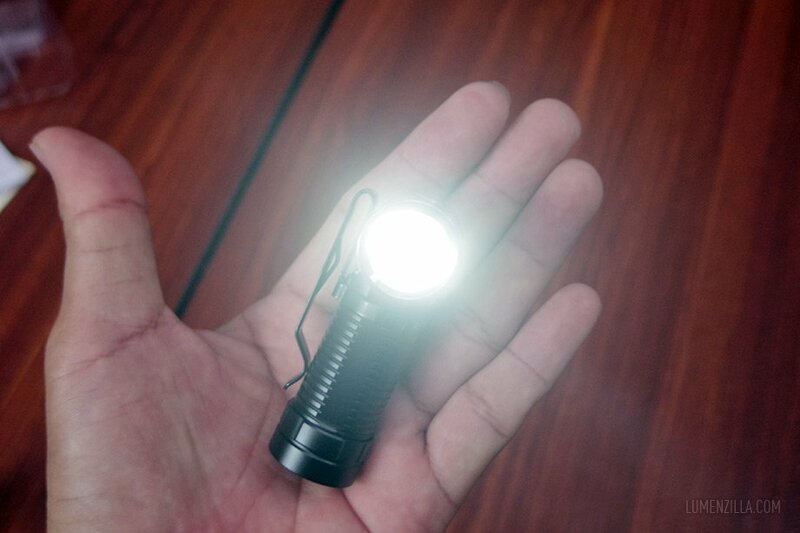 Smooth reflector is used in its head that made this little flashlight throw the beam for longer distance illumination. The switch is located on one of its side and the charging port is on the another side. It also come with a strong pocket clip that allow deep carry option. 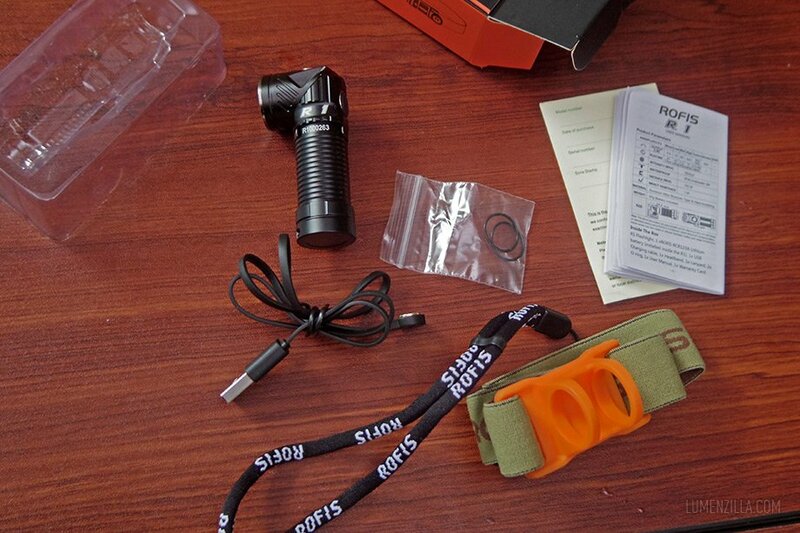 Rofis R1 has six operating modes: Turbo, High, Med, Low, Moon, Strobe, and SOS. It also has battery indicator, low voltage warning, and charging indicator feature. The unique thing from Rofis R1 is its adjustable head position. 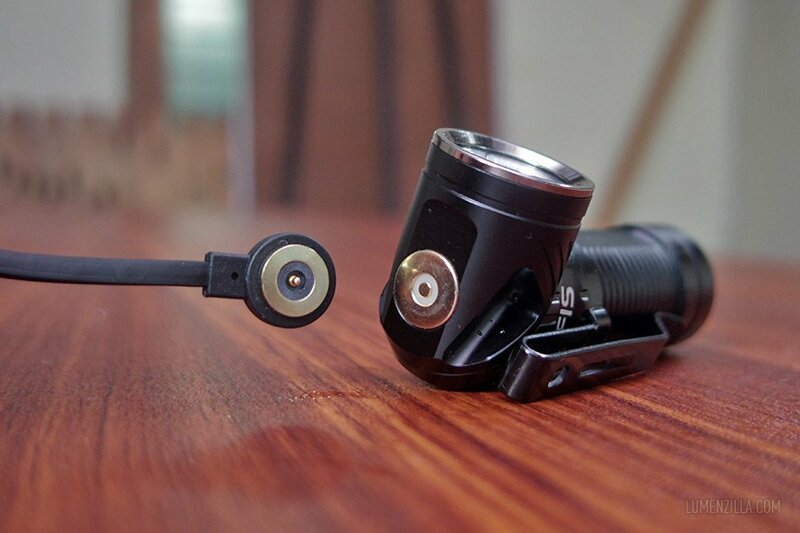 The head is rotatable up to 90 degree and turn this little flashlight into a nice angle light. Just push the head and it will slide on its pivot and turning it into nice little angle light. 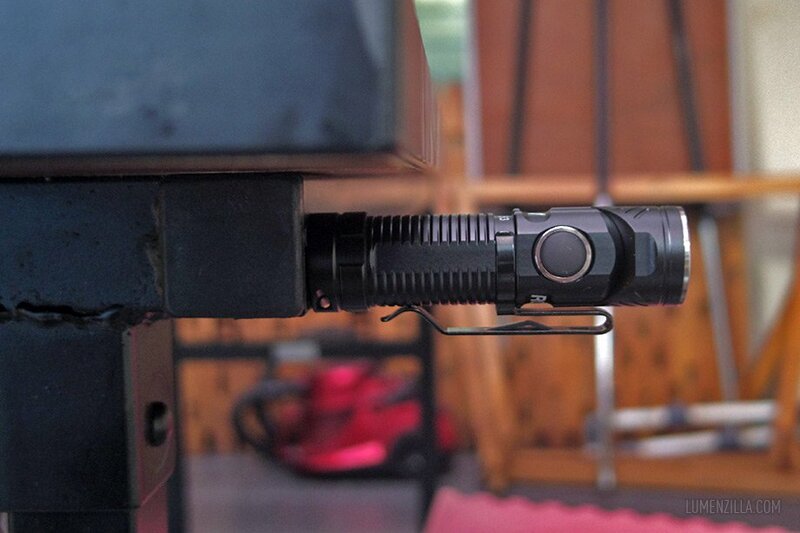 Being an angle light, the switch position is nice and easily accessible. Unfortunately, it become a problem when we use Rofis R1 as headlamp. While mounted into the headband, side switch is covered by the band and not easily accessible. Rofis should swap the switch position with the charging port. 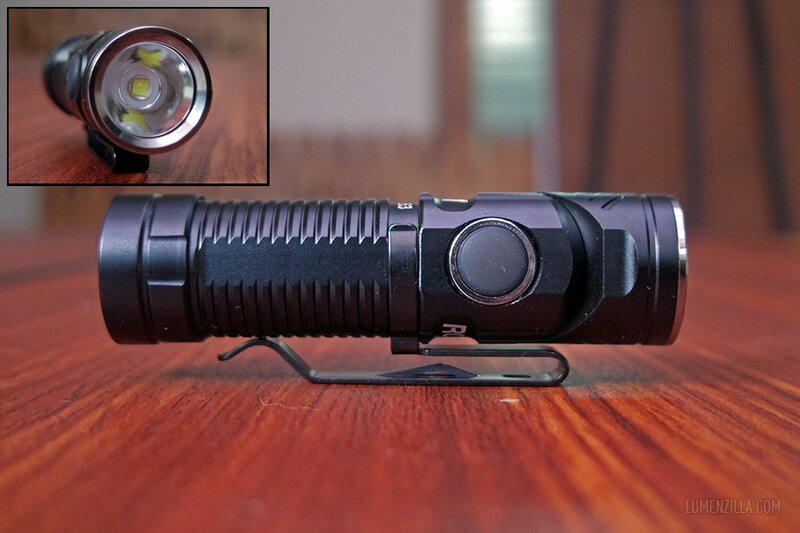 Other than problem with switch position, Rofis R1 is a good flashlight and angle light for all round application. Either for EDC or outdoor activities. It also has strong magnet inserted in its tail cap so we can attach it on any ferrous metal surface. It’s very handy when we use it and need to use both of our hands and don’t want to wear any headband. 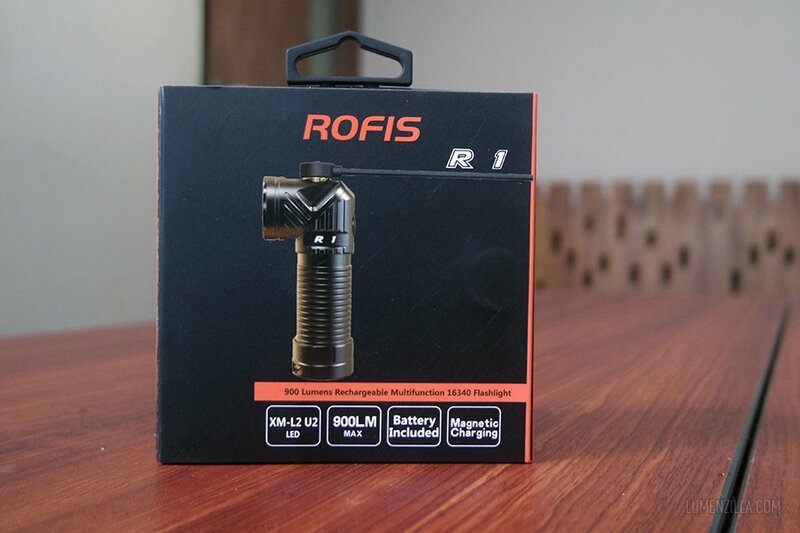 Another useful feature of Rofis R1 is the ability to charge the battery directly inside the flashlight. Using its magnetic charging connector, we can charge the battery from any USB powered device like smartphone charger, power bank, or any USB ports on PC/laptop or LED TVs. The magnet is very strong, just put the connector near the charging port and they will attract each other. 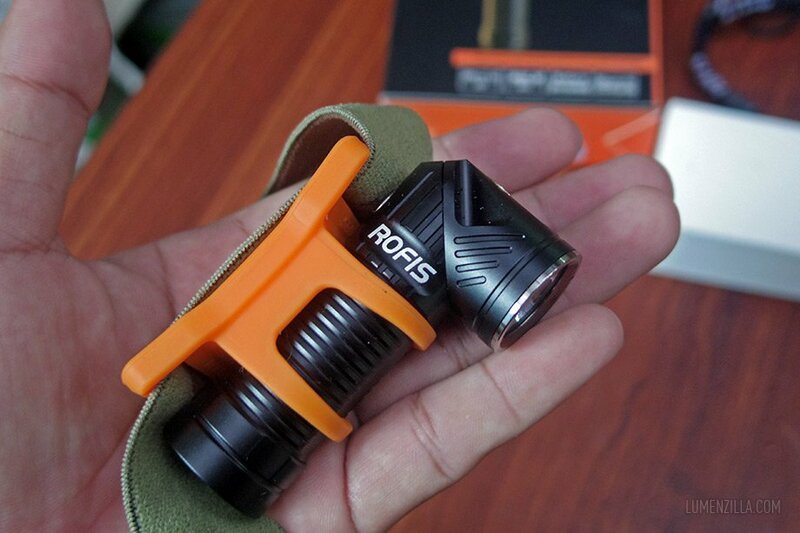 Rofis R1 is a good all round flashlight, either for outdoor or daily activities. 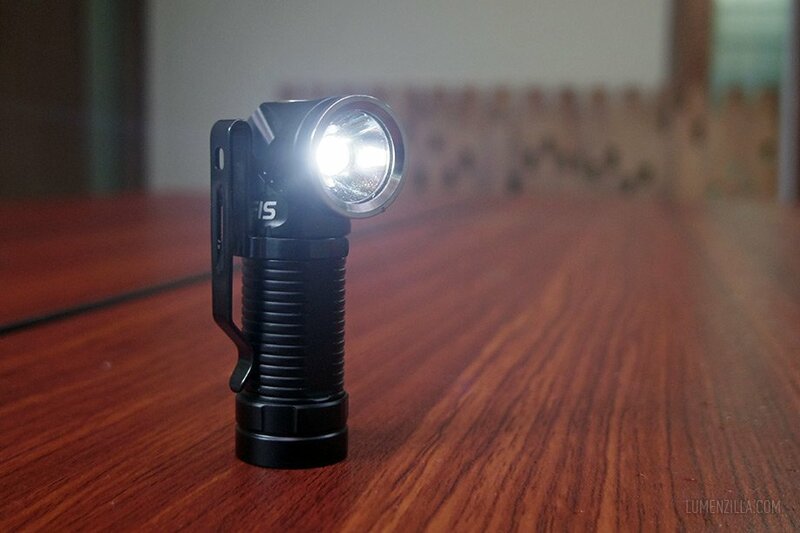 With the ability to transform the flashlight into angle light, makes it suitable for various scenarios. Magnet on its tailcap and the headband gives us options to use it free hand. Built-in charging feature and included charging cable is a good thing to have, especially if we carry it for a trip/traveling. The only con I found is the switch position. Should Rofis swap the switch and the charging port, this will be a perfect all round flashlight.